This is a fudge that the whole family will enjoy, especially the kids. 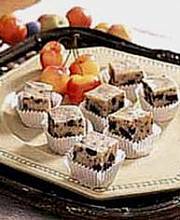 If you are planning a children's birthday party, why not make this delicious fudge for the kids to enjoy. You may want to have a few pieces yourself! Line an 8 x 8-inch square baking pan with foil. In heavy saucepan over low heat, melt chocolate with sweetened condensed milk and salt. Remove from heat. Stir in crushed cookies. Spread evenly in prepared pan. Chill for 2 hours or until firm. Turn fudge out onto cutting board. Peel off foil and cut into squares. Store tightly covered at room temperature. Makes about 2 1/2 pounds fudge. Wow! Terrific Excellent taste. It looks like I bought it at a Fudge Store instead of making it. I will definetly make some Fudge for gifts this Christmas. Thanks for the recipe. Very rich and tasty, and easy to prepare. Only problem was, it ended up a rather unattractive grey. Its really good! Quick and easy and tastes amazing! Everyone loved it . A Must Try! YES I AM BACK MAKING THIS FUDGE. MY FRIENDS ARE ASKING FOR THIS AGAIN THIS YEAR. THANKS TERRIFIC AND YUMMY!!!! Very easy to make and my boyfriend loved it. I'm on a diet on the other hand, but it looks to die for. I saved 2 pieces for my cheat meal next week!! Though the colour's a bit greyish..the taste's superb...I ate 1 pc b4 my kids do..It's 2 thumbs up..My colleagues gg to love this..